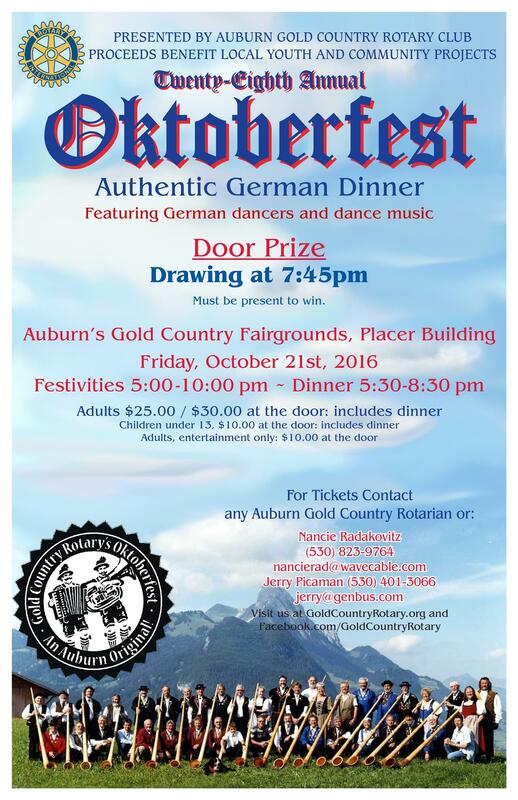 The 28th annual Gold Country Rotary Oktoberfest is here. Please join us at the Gold Country Fairgrounds October 21, 2016 from 5:00 to 10:00 PM. Tickets are $25 in advance, and $30 at the door. Tickets are available from any Gold Country Rotarian. Contact Nancie Radakovitz 530-823-9764 nancierad@wavecable.com or Jerry Picaman 530-401-3066 jerry@genbus.com for tickets or info. An authentic German dinner, German dancers and music are included.